Now, nine years later, the ice is still there, just like the moderate scientists predicted. It wasn’t just this prophesy that failed abysmally. The legacy media has not reported on it, but most alarmist predictions have failed. The earth did not warm significantly in the last two decades, a phenomenon that scientists refer to as the “pause” or “hiatus” in warming, and the weather has not been getting more extreme. Currently, the climate science community is in the awkward space between recognizing that warming has slowed down and acknowledging that this implies that the computer models are wrong. President Donald Trump has referred to global warming as a “hoax.” While this, as many of his other statements, is inaccurate, it is directionally true. It did not start as a hoax. Highly ideologically motivated scientists themselves at the center of the Intergovernmental Panel on Climate Change (IPCC). They wanted to be right, and therefore made a few shortcuts. Until around 2000, the IPCC was still heavily influenced by objective scientists. 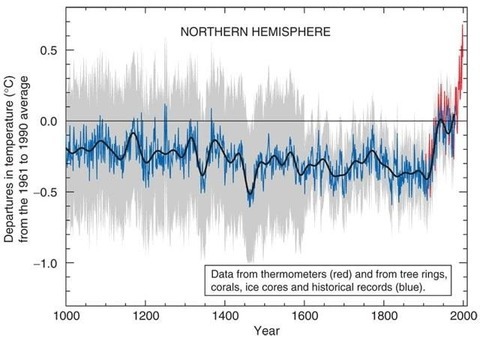 But in 1999, Dr. Michael Mann published a paper with a graph that became the poster boy of climate alarmism: The Hockey Stick Graph. It was rushed through peer review and plastered all over the IPCC’s Third Assessment Report in 2001. After this, no-one was allowed to doubt that humans were dramatically altering the climate. There was only one problem with it: Mann was incompetent, and the conclusions were bogus. A Canadian engineer called Stephen McIntyre started doing what no-one else had done before: He looked at the data and tried to recreate the result. Mann tried to smear him, but after many years one of the leading statisticians in the U.S., Edward Wegman, was commissioned by Congress to write a report on the Hockey Stick Graph. The Wegman Report was a devastating blow to the credibility of Mann. The report demonstrated that the method he had used to produce the hockey stick graph could be used to create any shape you wanted. The Wegman report should have ended Mann’s career, and many people in the IPCC should have lost their jobs for sloppy work and incompetence, but instead – because they have the media on their side – they’re still around. Then in 2009, someone leaked emails from this group of tightly knit scientists, and they showed less than an honest handling of the situation. Rather than dealing with the matter in a scientifically rigorous manner, they tried to cover it up. This leak has been referred to as Climategate. We do not have similar information from other areas of climate science, but some of the behavior we observe is consistent with fraud. One example is the claim that there is a 97% consensus among climate scientists. What is rarely mentioned is that most so-called climate skeptics fall within that 97%. Most skeptics do not believe that humans do not affect the climate. They merely say that the warming is small enough to be of no concern. Why do the alarmists have to falsely boost their credibility with inaccurate claims about how many scientists support their position? Another example is the continual adjustments made to historical temperature data. There are many error sources in temperature measurements that can cause false trends. Population growth, more asphalt and buildings and other things all produce spurious patterns in the data over time, and they, therefore, must be corrected. Most of the known error sources produce a false warming trend, and therefore the data need to be adjusted downward. However, since 2008, the National Climate Data Center (NCDC) has been producing modified data sets with the opposite effect. The graph shows the changes made to the data lately. Notice how the past has become cooler and the recent decades have been made warmer. What are the odds that every time a new data set is released, they have found some more warming? The behavior strongly resembles a pattern seen in elections in some districts where there is a close race between Republicans and Democrats. Time after time, if a Republican wins, someone “finds” some “lost” or “late” ballots and when they are counted, they mysteriously turn out to be almost all Democrats. Strange that. It could very well be that the temperature adjustments are scientifically sound, but if it were a fraud, this is precisely what you would expect to see. They leave the strong sense that many career alarmists are worried about their future and reputation and that actions are being made to change the observations so that they are in better agreement with the climate models. Since the legacy media is staying wholly silent and uncritical of the climate community, it is vital to remain vigilant and remind people of the dubious nature of their endeavor. The science is not settled, and there is even a chance that the greatest scandal in scientific history is in the making. The answer may come sooner than you think.